The Joint Legislative Budget Committee met on Wednesday to sign off on the 2020 budget recommendation. The $6 billion proposal was adopted after some changes from FY2019. 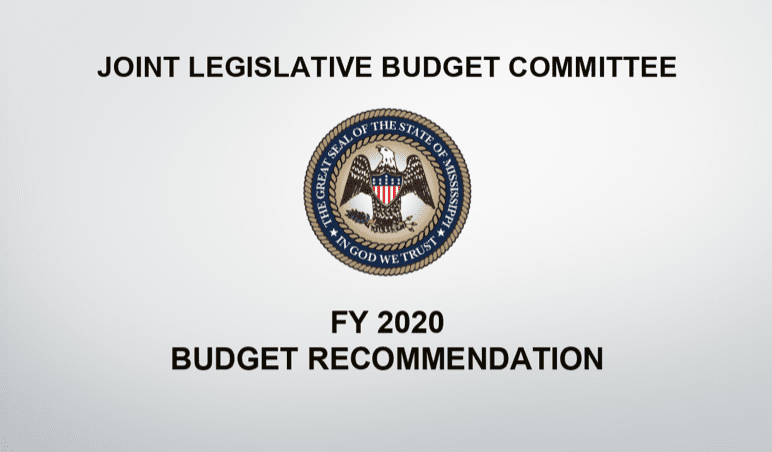 The recommended budget includes a FY2020 Revenue Estimate of $146.1 million over the FY2019 Sine Die estimate, a 2.6% increase. Leaders are aiming to maintain the 2% set-aside in General Funds. For the General Fund FY2020, $21.5 million was appropriated than in FY2019 with a total of $5.5 billion in that fund. “This budget puts us in a position where we anticipate having more than $400 million in the rainy day fund, and it holds the line on government spending. Over the past seven years, this committee – both Republicans and Democrats – have made hard decisions to keep control of spending and stop the reliance on one-time money. As we move into the legislative session, the appropriation chairmen are in a good position to meet the needs of the state,” said Lt. Governor Tate Reeves. Increased funding was seen for Public Safety; funding a Highway Patrol Cadet Class Salary) $3.5 million; fund sworn officer salary increases $0.8 million, and State Health Insurance Rate Increase (annual) $5.7 million. 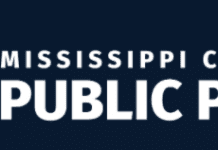 As originally suggested by Governor Phil Bryant in his Executive Budget Recommendation, he asserted that teachers should receive a $50 million pay raise that would be spread out over two years. However, the recommendation adopted on Wednesday did not include a pay raise to all teachers. 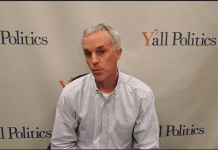 What it did include was actually over $790 million of retained reserves in “unallocated” funds which the speaker said would provide lawmakers with “great flexibility,” according to the Clarion Ledger. Those unallocated funds range from $402.6 million in the Working Cash Stabilization Reserve to $1.7 million in the Education Enhancement Fund and Tobacco Control Fund. 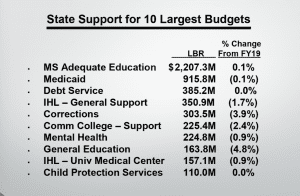 Capital Expense Funds are at $86.3 million and the 2% set aside in the General Fund of $116 million. 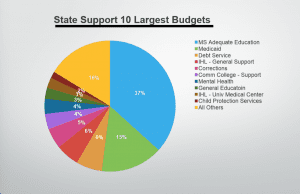 Education is still receiving the largest portion of the budget with 37%, then It’s Debt Service at 16% and Medicaid at 15%. 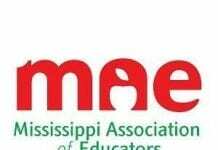 MAEP received a .28% decrease with $2.5 billion allocated and going primarily to public school funding. Institutions of Higher Learning saw a decrease of $1.46 million to $662 million in budget, and Community Colleges received $232 million, a 2.45% decrease. While there are slight reductions in education spending at all levels, other reductions included the deletion of funding for vacant positions after 3,011 unfilled positions will be done away with. Lawmakers plan to reduce funding for travel and contractual services, one-time expenditures, and utilizing available cash balances. Lawmakers will be back at the Capitol for the 2019 Legislative Session on January 8.